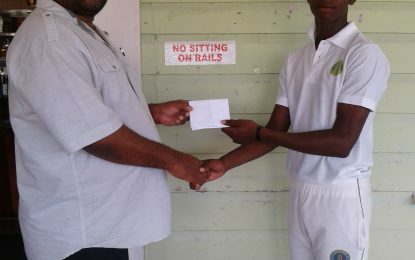 Club Secretary Hilbert Foster hands over the donation to Sir Rohan Etwaru of PMSS. Looking on are other Teachers. 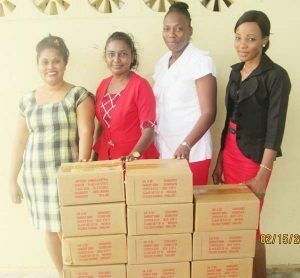 of February last assisted several schools in Berbice as they continue to make a positive difference in the lives of others. The cricket teams – Rose Hall Town Farfan and Mendes Under 15, Bakewell Under 17 and Second Division, Pepsi Under 19/Intermediate, Metro Females and Gizmos &Gadgets First Division and Under 21 have been mandated by the management to successfully complete a total of 160 programmes/activities as part of the RHTY&SC, M.S target of 500 for 2017. The Cricket teams donated a pair of batting pads, two pairs of batting gloves and a scorebook to teachers of the Port Mourant Secondary School to assist them to participate in a Guyana Teachers Union Cricket competition. A large collection of Educational Material was handed over to the Rose Hall Town, Belvedere and Tain Primary Schools along with the Rose Hall Town Nursery School. The teams also donated three cricket trophies to students of the Cyril Potter College of Education, Tain Campus. The trophies would assist the students to organise a cricket tournament at the Rose Hall Canje Estate Ground as part of their mandate. 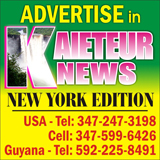 Club Secretary/CEO Hilbert Foster hailed the outstanding work of the eight cricket teams. Teachers of the four schools poses with some of the educational materials. The Club’s policy of mandating its cricketers to be involved in community development is to get them to understand the importance of giving back to society. 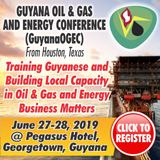 The RHTY&SC is the only cricket club in Guyana and perhaps the Caribbean which has such a programme, Foster proudly stated and over the last twenty years a total of 2100 programmes/activities were completed including 205 in 2017. Among major activities completed last year were the construction of a multi-million family playfield, hosting of a Massive Say No/Say Yes campaign, multi-million Christmas Charity campaign, GUYOIL Traffic Educational Programme, Christmas Village and distribution of $1M worth of school bags to less fortunate students. 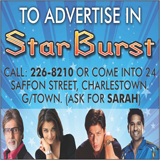 He urged the Club Cricketers to uphold their high standards on and off the cricket field, while issuing an appeal to other cricket teams across Guyana to develop similar programmes for their membership. 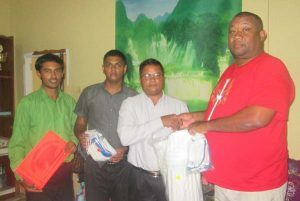 Senior Teacher of the PMSS, Rohan Etwaru, who accepted the cricket gears from the Club, expressed gratitude to the eight teams. Etwaru noted that the RHTY&SC, M.S should be very proud of its achievements over the years and expressed hope that others would continue to benefit in the future.